"I was born the son of a Texas Moonshine maker. My Father, Sue, was considered by many to be the finest Moonshine maker in all of Texas, because of the fine grains he used to make his corn whiskey. My Mother Elbessie, along with her brothers and sister, made wine from the various fruit we grew." Okay: Best. Winemaker. Story. Ever. Do you not hear the harmonica and guitar playing a warmhearted theme while you read it? And hell yeah, I'm biased because Mac McDonald's a Texas native. But if you can do better than being the son of the original Boy Named Sue, bring it. 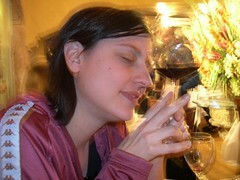 But before I even got this super charmer story, I tasted the 2005 Gary's Vineyard Pinot and was smitten. Oh, such good stuff...fragrant, cool and complex, full of rich, silky Santa Lucia Highlands fruit goodness with just the right acidity. This is Pinot made by someone who loves Burgundy and understands the potential of his AVA all at the same time. Have you tripped on the Santa Lucia Highlands AVA, by the way? I could just kick myself for not checking out the other side of the Santa Lucia Range on my trip last year. It's just a little happy love cradle for the Burgundy varietals---long growing season, early morning sun followed by cool maritime breeze, protection from the wind. Which reminds me...can I make a new rule? If you simply must boast about having just come from "The Wine Country" in California, please specify which wine country that might be. I'm glad you got to go to Sonoma and all, but there's a couple more AVAs in the state, people. And don't think I'm just calling out my Texan bretheren on this one---I've had people from California do this. If you think there's just the one place in the Golden State that produces amazing wines, you should get out more. Glad I got that off my chest. 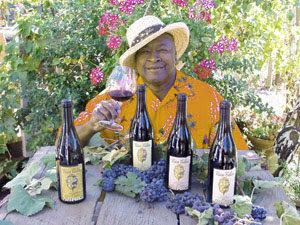 Now: please go to Vision Cellars' website and read about Mac. Then save your pennies and get a bottle of his Pinot for your birthday. I'm going to go out on a limb and do this wine and I will do so because I am a Texan and moonshiners are just cool...and because I trust your judgement. Why? I don't know, because I don't even know you, but I like your blog and I like your "vision". I'll let you know how my experience goes. Peace, love and chicken grease. Stumbled here today and found a great blog. I pour here in town too and like your philosophy. Care to give a hint as to where one might find you wielding a shaker? Great going Sir,Keep the good work up.